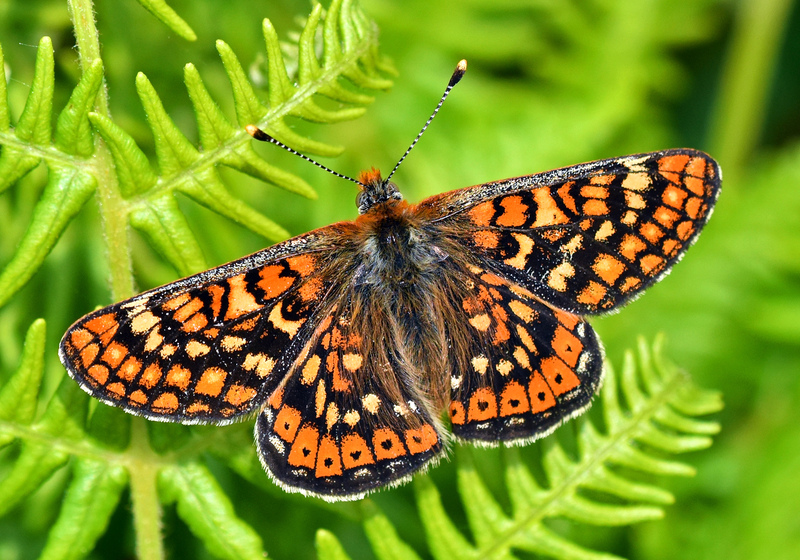 The Marsh Fritillary butterfly, Euphydryas aurinia, is distributed right across the Palaearctic region – from Ireland to Russia. It is a species complex, divided into mostly distinct taxa or subspecies, with slightly different appearances, but strongly different ecological requirements (Casacci et al., 2015; Korb et al., 2016). These local, or regional populations have often specialised on, or adapted to, different host pants. 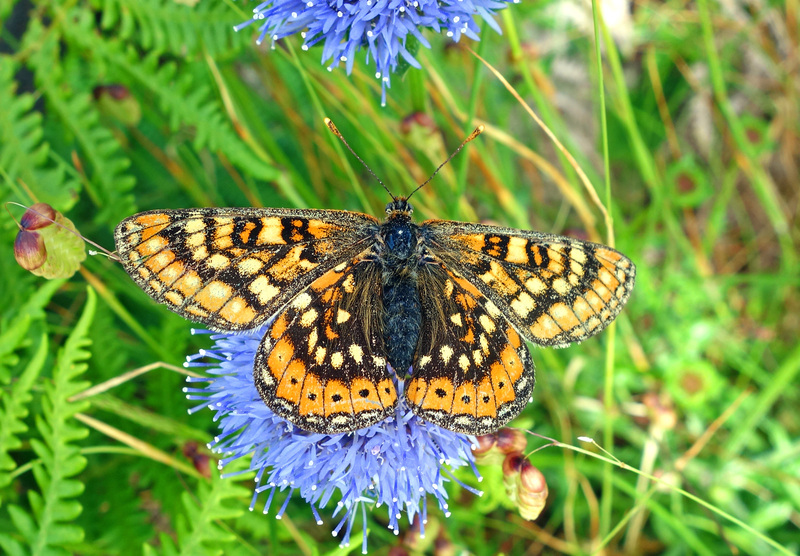 For example, in much of northern and central Europe – including the British Isles – Marsh Fritillaries usually only feed on devil’s-bit scabious (Succissa pratensis), whereas in the southern parts of its European range the larvae also feed on field scabious (Knautia arvensis), small scabious (Scabiosa columbaria), Giant scabious (Cephalaria leucantha) and honeysuckles (Lonicera implexa and Lonicera etrusca) and other species (Stefanescu et al., 2006; Meister et al., 2015; Pinzari, M. et al., 2015). The polyphagous diet of the southern populations seems to have helped them persist and survive. Remarkably, each growth stage of the larvae of an Italian subspecies (E. aurinia provincialis) fed on different host plants, partly depending on which plant they had been laid (and hatched out) on (Pinzari, M. et al., 2015). In Galicia, where all of these photographs were taken, the larvae are said to feed on common honeysuckle (Lonicera periclymenum), Small Scabious (Scabiosa columbaria) and Foxglove (Digitalis purpurea)(Iglesias & Astor Camino, 1992). Feeding on Lonicera species seems to be an Iberian specialisation. 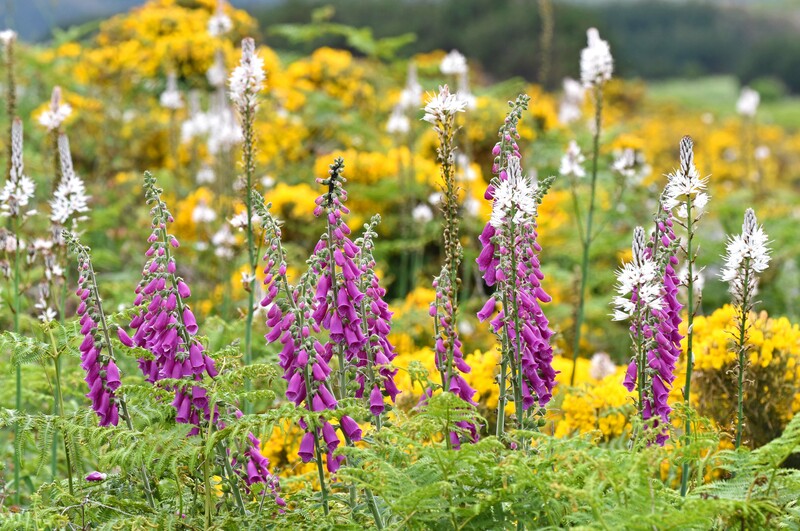 There are plenty of honeysuckle and foxglove plants in this locale (see below). The Marsh Fritillary butterfly, Euphydryas aurinia, appears to be thriving in this area, as well as others in Galicia, as I have blogged about before. 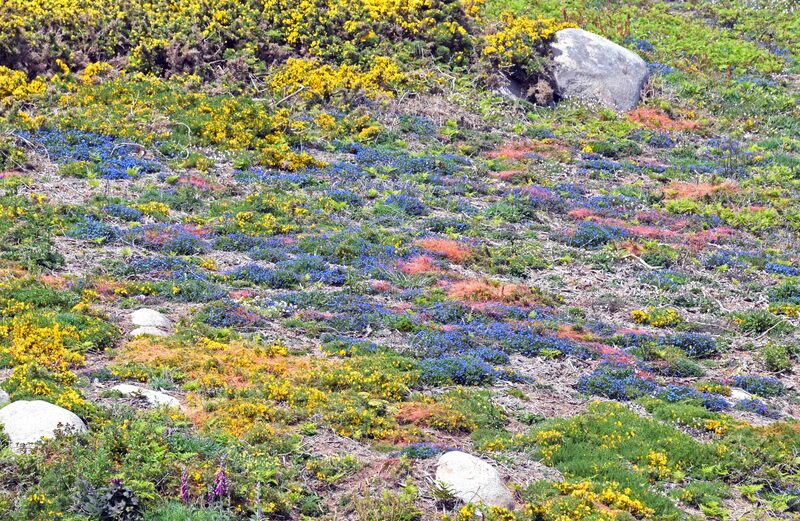 This species can be found in a range of very different habitats across Europe, from raised bogs to semi-natural dry, calcareous grasslands, but seems to need an uneven patchwork of short and long vegetation. The subspecies in Spain and Portugal, Euphydryas aurinia beckeri, is supposed to be larger and brighter than most other subspecies – with bold, black markings – but in my experience it is very variable and I have no way of knowing if it is indeed this subspecies, other than by location. There is only one generation per year and although they can be seen from May into June, individuals probably only live for a week or so, on average. In a study carried out in Slovenia, the average adult lifespans of E. aurinia were 6.3 (males) and 8.6 days (females), respectively (Jugovic et al., 2018). Nevertheless, some individuals live much longer than these averages and there are some very worn males flying about by mid June. The males are much more active in terms of mate seeking than the females. 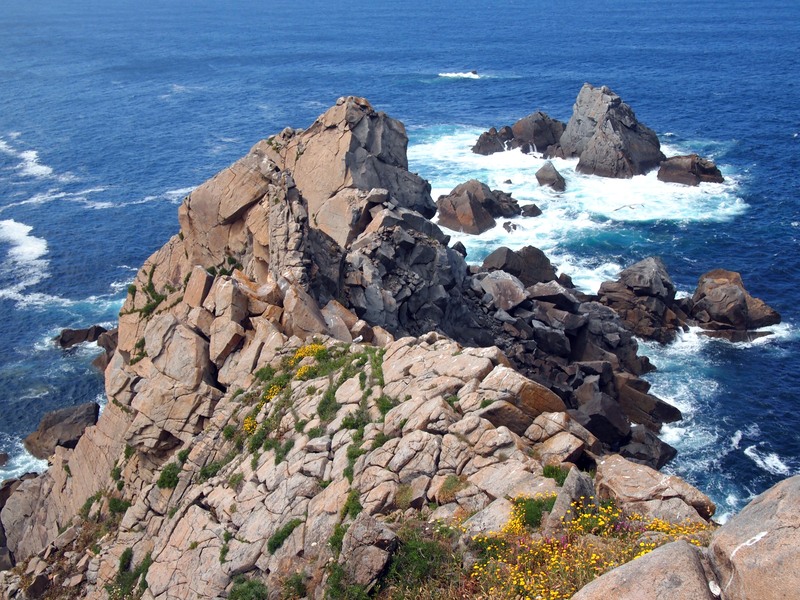 The area where this species in locally abundant, is called Estaca de Bares (or Cape Bares) which is is the northernmost point of Spain and the Iberian Peninsula, at a latitude of 43 ° 47 ’38 “North. 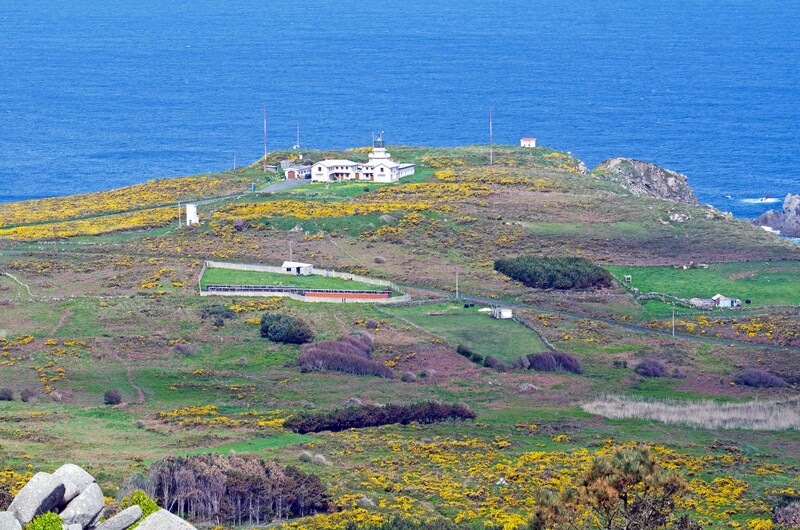 There is an old lighthouse near the point, visited by many tourists coming to look north over the Bay of Biscay. This species appears to thrive where there are large areas of pasture land grazed by cattle at low intensity (Bignal, 1998). 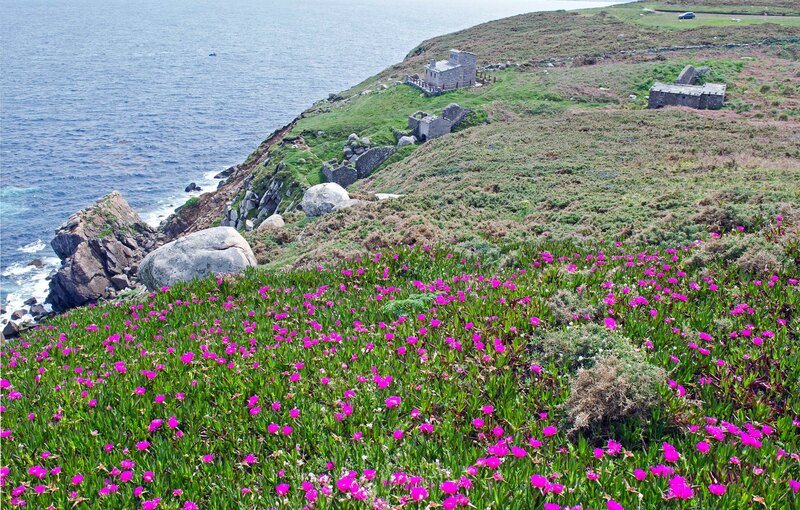 It has suffered from the abandonment of pasture land in many areas, but Galicia is a region where there is still plenty of traditional agriculture – with many small-holdings and small family farms – and low intensity grazing. 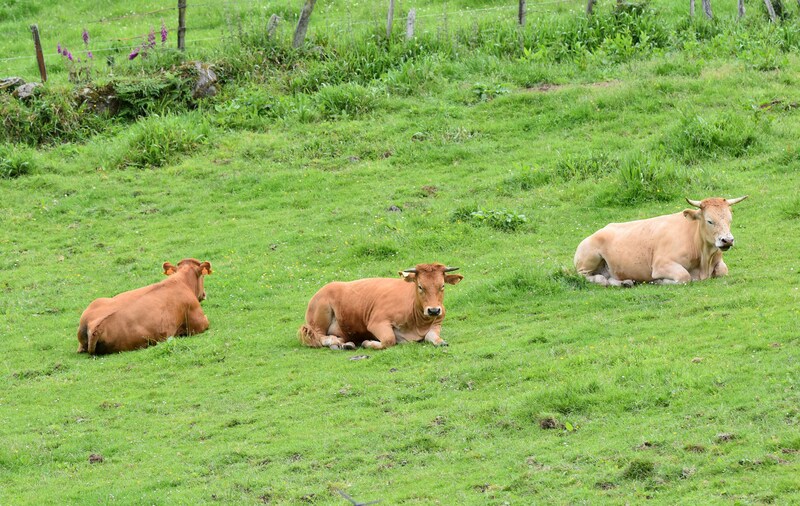 Cows in a field in Galicia, Spain. Taking a break from grazing! 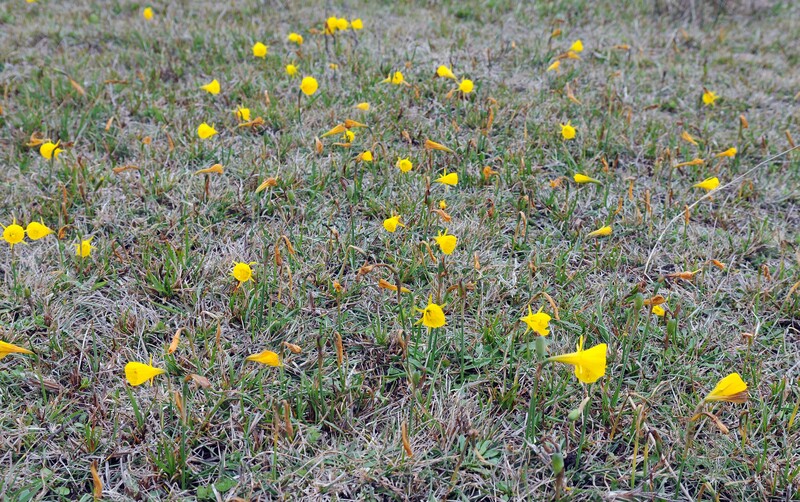 In one local field in this area – on which a few cattle occasionally graze – the beautiful yellow, Hoop Petticoat daffodils (Narcissus bulbocdium), shoot up every Spring, in early April (see below). Hoop petticoat daffodils (Narcissus bulbocdium). Cabo de Bares, Galicia, Spain. The area near the point is however, also dominated by an invasive plant: Hottentot-fig (Carpobrotus edulis). 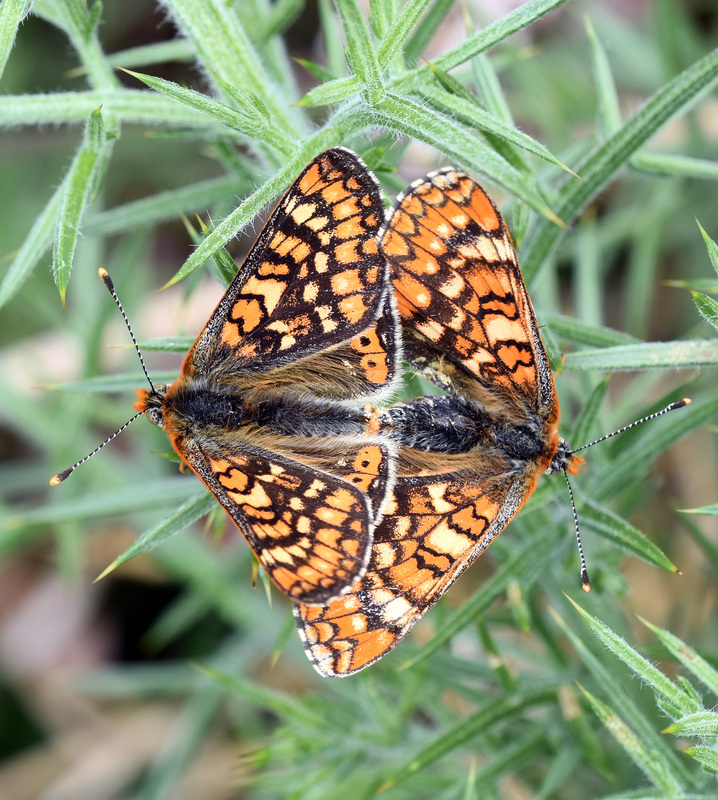 It blankets huge areas in the Spring and must be a grave threat to many local plants, including some of the host plants of the Marsh Fritillary. I took a picture of a patch of the blue Scrambling Gromwell (Lithodora diffusa) flowers (below). 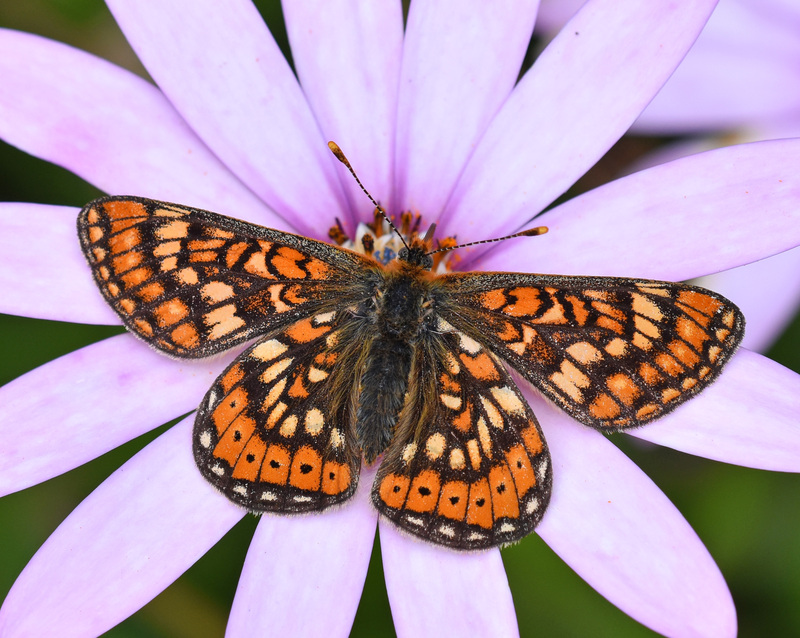 Marsh fritillaries are said to exist in a patch-work of interconnected colonies, known as a meta-populations. The butterflies need to be able to move from one patch to another to ensure that the whole population persists into the future. Although both sexes can be fairly sedentary, not moving more than 60 m (Junker & Schmitt, 2010) they can also fly at least half a km (Jugovic et al., 2018) and appeared to be hill-topping on the local summit in this area. Scientists have worked out that this species needs large areas (70 ha plus) of suitable and continuous habitat in order to survive (Bulman et al., 2007). Similarly, the population must be of a sufficient size, at least 1,800 individuals to thrive into the future (Schtickzelle et al., 2005). I think this area in northern Spain, and many others like it, contain such sustainable populations, but the region is changing and agriculture is inevitably becoming more intensive as people move off the land and small-holdings are consolidated. This beautiful species is threatened by an increasingly fragmented landscape in all parts of its range, but as long as there are large areas of pasture grazed by cattle in the traditional, low intensity fashion, with sustainable management of pastoral and agricultural activities – which there certainly is in Galicia, and other parts of Spain (Munguira et al., 1997) – then this species will have a bright (and colourful!) future. Bignal, E. M. (1998). Low-intensity livestock systems-defining ecological attributes. In European policy evaluation network (ELPEN) workshop (Vol. 1)..
Bulman C.R. et al. (2007). Minimum viable metapopulation size, extinction debt, and the conservation of a declining species. Ecol. Appl. 17, 1460–1473. Casacci, L. P. et al. (2015). 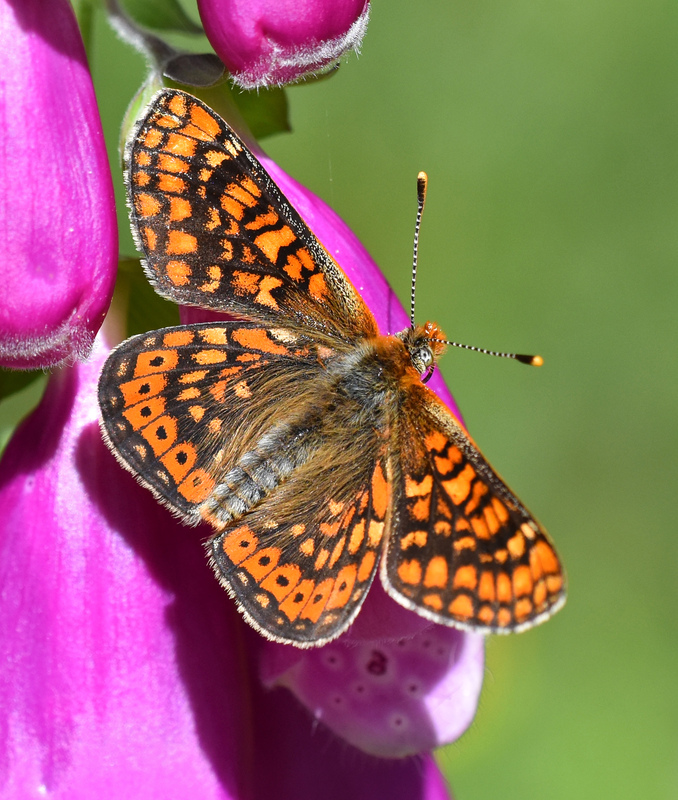 Dispersal and connectivity effects at different altitudes in the Euphydryas aurinia complex. Journal of Insect Conservation, 19(2), 265-277. Ghidotti, S. (2016). Evaluation of agro-pastoral activities on insect biodiversity and conservation in northern Italy rangelands. PhD thesis. University of Milano-Bicocca, Italy. Iglesias, X. L., & Astor Camino, X. (1992). Guía das bolboretas de Galicia. Edicións Xerais de Galicia. Jugovic, J. et al. (2018). Demography of the endangered butterfly Euphydryas aurinia (Lepidoptera: Nymphalidae): A case study of populations in sub-Mediterranean dry calcareous grasslands. European Journal of Entomology, 115. Junker, M., & Schmitt, T. (2010). Demography, dispersal and movement pattern of Euphydryas aurinia (Lepidoptera: Nymphalidae) at the Iberian Peninsula: an alarming example in an increasingly fragmented landscape?. Journal of Insect Conservation, 14(3), 237-246. Korb, S. K. et al.(2016). 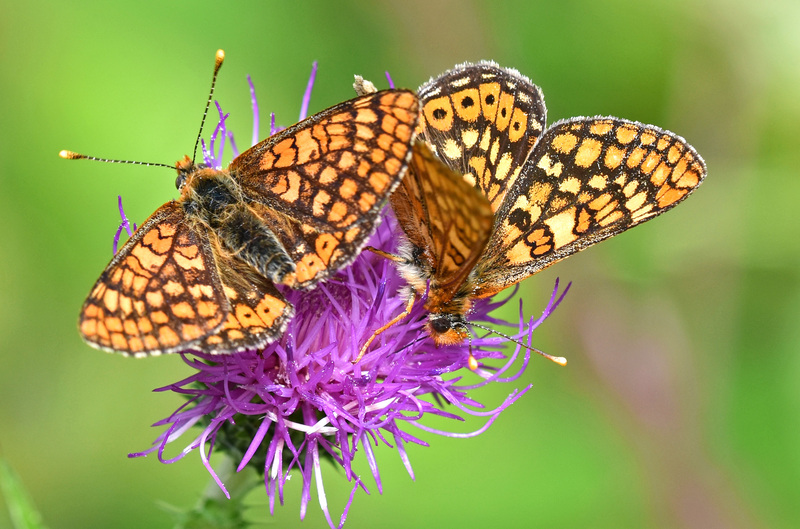 Cluster biodiversity as a multidimensional structure evolution strategy: checkerspot butterflies of the group Euphydryas aurinia (Rottemburg, 1775)(Lepidoptera: Nymphalidae). Systematic Entomology, 41(2), 441-457. Meister, H., Lindman, L., & Tammaru, T. (2015). Testing for local monophagy in the regionally oligophagous Euphydryas aurinia (Lepidoptera: Nymphalidae). Journal of insect conservation, 19(4), 691-702. Munguira, M. L., Martín, J., García-Barros, E., & Viejo, J. L. (1997). Use of space and resources in a Mediterranean population of the butterfly Euphydryas aurinia. Acta Oecologica, 18(5), 597-612. Pinzari, M., Pinzari, M., & Sbordoni, V. (2016). Egg laying behaviour, host plants and larval survival of Euphydryas aurinia provincialis (Lepidoptera Nymphalidae) in a Mediterranean population (central Italy). Bollettino della Società Entomologica Italiana, 121-140. Schtickzelle, N., Choutt, J., Goffart, P., Fichefet, V., & Baguette, M. (2005). 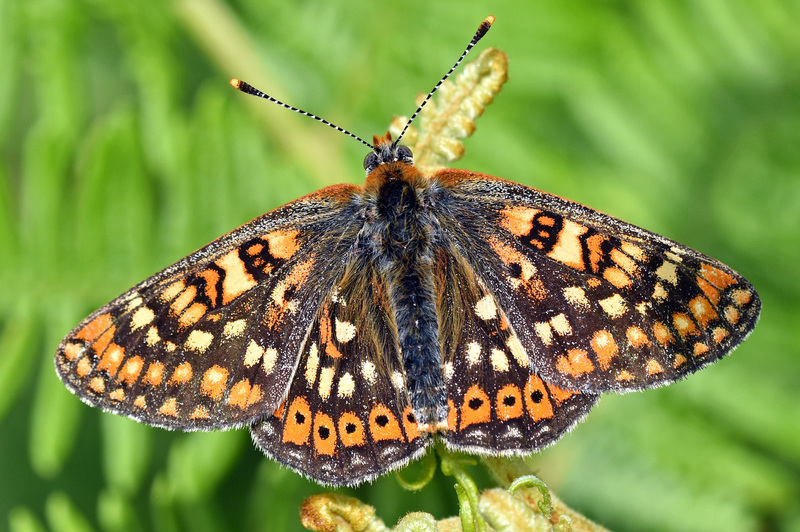 Metapopulation dynamics and conservation of the marsh fritillary butterfly: population viability analysis and management options for a critically endangered species in Western Europe. Biological Conservation, 126(4), 569-581. Stefanescu, C., Peñuelas, J., Sardans, J., & Filella, I. (2006). Females of the specialist butterfly Euphydryas aurinia (Lepidoptera: Nymphalinae: Melitaeini) select the greenest leaves of Lonicera implexa (Caprifoliaceae) for oviposition. European Journal of Entomology, 103(3), 569.
van Swaay, C. et al. (2012). Dos and Don’ts for butterflies of the Habitats Directive of the European Union. Nature Conservation, 1, 73-153. Van Swaay, C., & Warren, M. (1999). Red data book of European butterflies (Rhopalocera) (Vol. 99). Council of Europe. van Swaay, C. A., & Warren, M. S. (2006). Prime butterfly areas of Europe: an initial selection of priority sitesfor conservation. Journal of Insect Conservation, 10(1), 5-11. Previous Previous post: Two hornet mimics and a new model! Next Next post: Beetles taking off! A lovely butterfly that reminds me of stained glass windows.